Another new Jump for Joy Pattern. 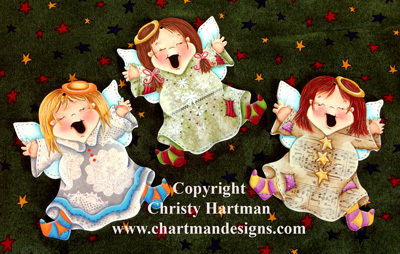 These three Christmas angels are so happy for the holiday that they are jumping for joy. I've designed these so that there is a red head, a blonde, and a brunette. I have simplified the painting process by decoupaging pattern paper onto the dresses, needing only to shade and highlight which should make them super easy to finish up for craft shows and gift giving. They are approximately 4" tall and 3.5" in width and would be darling used as an ornament, strung onto a ribbon as a holiday necklace, or even as a pin. They could be enlarged and added to a plate, bowl, holiday cake plate, or how about a Christmas Card box. I think that the potential for these three is endless. I'd love to see your creative use for this pattern. The laser cut wood pieces for this pattern are available under the Supplies category in the Main Menu, unfortunately the surfaces are currently unavailable until the first of March. These are also available as Digi Stamps. You are purchasing an E-Pattern and once payment has been received you will receive an email with instructions to download the pattern.